madamewoo and I have some very interesting conversations around the apartment. But tonight, we noticed that we often fall into the same patterns about certain topics. Topics where we are at our wittiest. 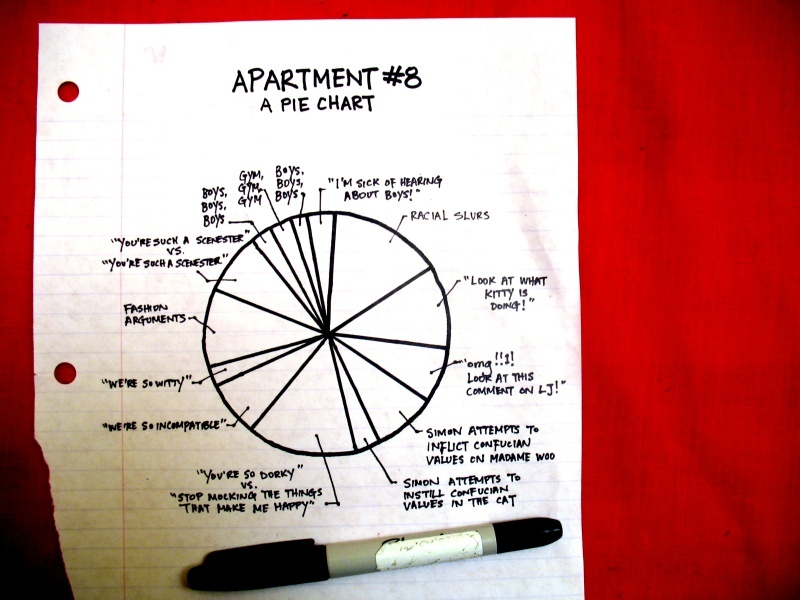 Since she's been procrastinating about STAT 231, we justified drawing a pie chart. Statistically, it's completely and utterly valid, I assure you. If a reality television producer saw this, we'd make five-thousand easy! If racial slurs > boys, boys, boys, then not so much money from the networks. Can you adjust for the tv censors? I TRY to talk more about boys, but that's where Simon comes up with "I'm so sick of hearing about boys!" What??? Gaysians don't get their own slice? Or are they covered by boys,boys,boys/racial slurs? Actually, the topic has severely diminished over the past couple of months. One of my roommates is black. I'm sure if I included "racial slurs" on our pie chart, the slice would be at least that big. Is "you're so dorky" usually you directed at her, or her directed at you? Also, nice blocking of the Sharpie logo...did they not pay the product placement fee in time? Me: "You're so dorky Simon!" Simon: "Stop mocking the things that make me happy!" Also, what racial slurs? Gay asian? My favorite right now is blaming * on the jews, which is ironic and funny because I'm in a largely islamic, jew/israeli banned country. So e.g. blaming traffic here on the jews, expired food in the fridge on the international zionist conspiracy, etc. is always fun. And were one of my neighbors to overhear, it would not be considered bad. Especially fun is blaming arab v. arab problems on the jews, but I can't take credit for that, as they've been doing it for years. So e.g. blaming slow government services on the jews is perfect. haha! this is awesome, and ridiculously similar to conversations i have with friends. Even though we've never met, I now feel a strange kinship with you. I love pie charts almost as much as I love pie. I bet nearly everyone has an amusing (or bitter) story about stats in university. I can't believe 'fashion arguments' have such a huge chunk of this pie when a man is involved. You have no idea how many times I have to say "yes, that outfit looks fine" before we can get out the door. HILARIOUS. You are both too awesome. I don't have time to check LJ often anymore or comment, but the few times I've read your entries I am way too amused.It looks like you've been having a lot of fun and I am happy for you. You make me want to write! You should write! Not only is it tasty, it's also nutritious.